After dropping the NEET PG attempt, you have to make a study schedule where you have to ensure to study for at least 8–9 hours daily and practice as many questions as much as possible. And more importantly you need to motivate yourself every day to keep focused. Also your marks in NEET 2017 don’t matter anymore and it’ll be much better if you let go off the recent past and focus on what lies on your way ahead. Being a dropper, you might as well have an idea as to how the paper is set, what are the important bits, how is the feeling on the day of the paper and so on. In order to get success in the medical entrance exam NEET PG 2018, students need to analyze their strengths and weaknesses and plan a systematic method to make the most out of them. You need to build a strong roadmap to gradually eliminate or minimize the impact of such limitations. NEET PG 2018 is the most important exam for medical students who want to secure seat in PG. The online mode of exam plays a crucial role in selection. There are various factors students should consider in making it a success. Exam Pattern– Due to vast syllabus it is difficult to predict particular exam pattern and particular chapters. Also there is large database of questions. Though in offline mode of exam it is easy to predict exam pattern and follow that topics which gives more marks in few time. During the exam while online it becomes important to be quick enough to answer the questions from whatever topic it arrives. Hence it is very necessary to prepare for larger topics and more thoroughly. Reading Speed– The second important thing is your reading speed. If you are reading on computer screen then it is slower than to reading on paper. The reason behind this is that you have to scroll up and down while reading on screen; you can’t mark anything in topic. While in offline you can mark and no need to scroll up and down, this simply saves your time and this provides help while answering questions. This one single thing reduces and increases attempts on an average10- 12 questions. This is yet common problem but faced by every student. For this you have practice more and more so that you become habitual for this. Technical Challenges– Keep this thing in mind that it is technology based test that’s why there is a possibility of technical failure. It is not necessary that it will but yes it can. Sometimes due to poor network server it takes time to load some question at picture related questions. At that time you have to keep patience and no need to refresh it, it will load as it gets network properly. But yes during exam these things literally distracts one’s mind. And you may face problems in login also; don’t panic, your invigilator will be responsible to resolve all your technical problems. Choosing the right question– This particular heading simply implies that suppose you have found 3-4 difficult questions continuously then in that situation you have to skip them and move forward. Just skip them and save your time by securing minimum cut off marks. It is very necessary to choose right question to attempt and crucial one to skip. Time management plays another important role to scan the question paper according to your ability. Marking of answers: In the online mode of exam students may make mistake in clicking the wrong answer. Be very careful while clicking right answer. 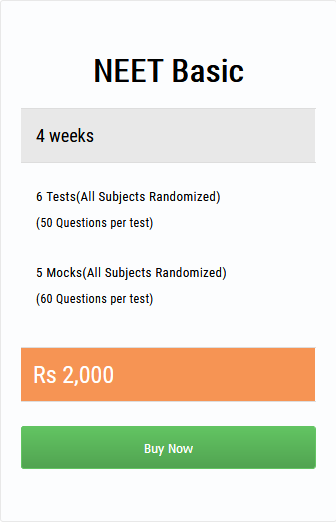 What are the Prime Requirements to Crack NEET PG 2018?